Jetstar Asia enters its second year of operations between Singapore and Naha, Okinawa this month with the start of the additional service, taking it from three to four return flights a week. 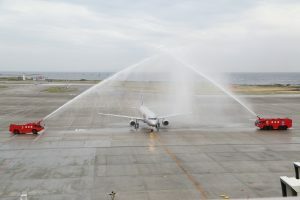 The new fourth service, which began operation on 15 November, operates on Thursday, departing Singapore Changi Airport at 2.00am and arriving into Naha, Okinawa at 8.00am. The return flight departs Okinawa (Naha) at 9.00am and arrives in Singapore at 1.25pm. Today, Jetstar Asia CEO, Bara Pasupathi, met with the recently appointed Governor of Okinawa, Mr Denny Tamaki, to discuss the popularity of the route as an all-season destination. “Jetstar is the only airline providing direct scheduled services from Singapore, with the additional service adding more than 9,000 seats a year,” said Mr Pasupathi. “In the first year of operation, more than 33,000 passengers travelled to Okinawa on Jetstar Asia and we are confident the fourth weekly service will provide even greater flexibility and choice to our customers”. “Our strong relationship with the Okinawa Prefectural Government and Okinawa Convention and Visitors Bureau, has been instrumental in helping us to promote Naha as a must-see destination in its own right, and as international gateway to mainland Japan. “As we build on our foothold in Japan, we look forward to offering our customers greater access to Japan, via Okinawa, and to the extensive Jetstar Japan domestic network”. With tens of thousands of customers transiting through Singapore every year, Jetstar is capitalising on this growth market and is looking to promote the service in not only Singapore, but to passengers in Indonesia, Malaysia and Australia. Naha is the second Japanese port that Jetstar Asia flies to after Osaka.